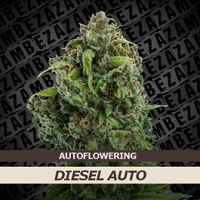 Zambeza Seeds have taken the best of New York City Diesel and crossed it with Lowryder #2, then crossed that with Lowryder #2 again to make this new variety of autoflowering Cannabis seeds, and the result is a Marijuana strain that offers high quality yields and flavor in super quick time. From germination to harvest, Diesel Auto weed seeds take just 8 – 9 weeks, and because they are autoflowering they are really easy to grow. No veg, no flowering room, no hassle. Just up to 375 grams per m2 of luscious harvest when growing Cannabis indoors or up to 60 grams per plant outside. Like all good Diesels, Diesel Auto Cannabis seeds are full of delicious chemical flavor which comes through in a rich deep smell that needs ventilation when air flow is limited, and if you get the filtration right, even guerrilla growing is possible as these little babies never reach more than 70 cm indoors. But there’s nothing small about the power of Diesel Auto Marijuana seeds. 15% THC levels and really low CBD mean Diesel Autos have a cerebral kick you are never going to forget. She is perfect for relieving stress, depression and fatigue. Energy and euphoria is what it’s all about, keeping you clear and clean and totally focused.